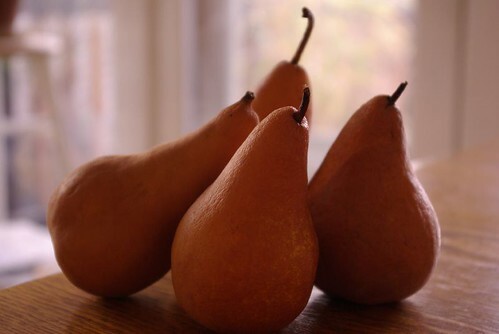 There’s a box of lovely bosc pears from the Wenatchee Valley that are just ripening in our basement. Pears are a real use-it-or-lose-it sort of fruit, so I thought I’d make one of my pear custard pies to take on a visit to a relative. A good idea, but a few problems in the execution. The pie baked up beautifully, with a golden crust and pretty browned-sugar spots on the top, but of course it hadn’t set up completely (I could probably have left it in the oven a little longer). Generally custard pies will finish setting up on their own, so I didn’t worry about it. But instead of letting the pie cool on its rack in the kitchen, we impatiently packed it up in a cake carrier and took it off in the car. Lesson learned: do not transport a hot, unset custard pie in an enclosed container. Between the jiggling of the moving car and the heat trap of the carrier lid, the pie completely liquified on the trip down, becoming instead a pie crust filled with sweet pear soup. I put it in the fridge when we arrived, but it only congealed slightly. Aargh. However! Once we had polished off our lovely takeout dinner from Szechuan Bistro (if you’re anywhere near that neighborhood, and you haven’t had their dry-fried string beans with tofu, go get some now), we felt able to face the wreck of the pie. There was vanilla ice cream in the house, so I simply scooped the pie filling out of the shell and dumped it all over ice cream. It tasted wonderful. But next time? I’ll make sure it stays pie.